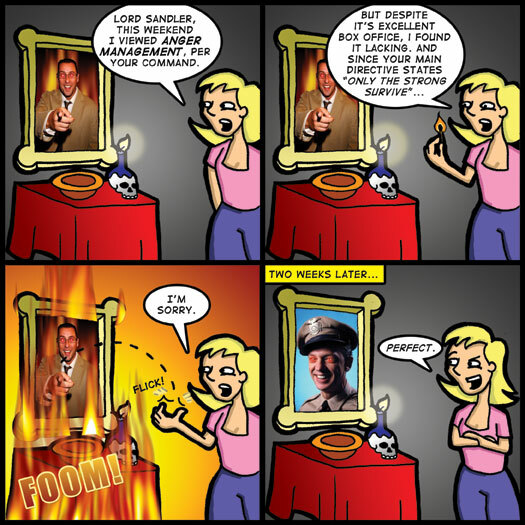 Lord Sandler, this weekend I viewed Anger Management, per your command. But despite it's excellent box office, I found it lacking. And since your main directive states "Only the strong survive..."
I just finished watching Charlie’s Angels. It was fun, but not too far from the usual movie plot. It was weird to see Crispin Glover looking like Willard. This weekend I watched Riding in Cars with Boys. It was Patti’s choice, but I think I ended up liking it as much or more than she did. I let her pick the rental because she said “you’ll probably want to watch some movie about drugs.” Which of course… was true. But I decided to be nice and behold, the plot that unfolded included Steve Zahn as a drug addict. Woo! We also saw Anger Management. My initial reaction was that it was okay. The cameos, although destructive to the overall plot, added to the enjoyment of the flick. It was a Kevin Bacon Game dream. I still think Happy Gilmore and Billy Madison are Sandler’s funniest films. Looking back on this recent escapade, I think they tried to cram too much stuff into one movie. The ending was rushed as well, although it seemed to take frickin’ forever. I am ready to watch part four of Band of Brothers. It is awesome. Get your hands on this mini series (not my copy) and watch it, NOW!